Fairy tale fever has descended on New York City. Broadway fans are flocking to Red Riding Hood: The Musical; museums are exhibiting art inspired by the Brothers Grimm; and Clare Cosi and her merry band of baristas give their coffee truck a "Jack and the Beanstalk" makeover for a Central Park festival. Clare's coffee hunter ex-husband contributes a bag of African beans with alleged magical properties. His octogenarian mother entertains customers with readings of the grinds, but Clare remains skeptical--until she receives a vision that helps her find a young model's body in the park's woods. The police dismiss "sleeping beauty" as the victim of a drug overdose. Then Clare uncovers evidence that points to a list of suspects--from a New York Giant to quite a few wicked witches--and a cold case murder that reaches back to the Cold War. Now Clare is really in the woods with a dangerous predator on her heels and an investigation that leads from a secret Prince Charming Club right back to her own NYPD detective boyfriend. If she doesn't solve this mystery, those magic beans predict an unhappy ending. 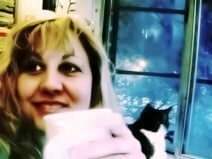 Visit Cleo Coyle at her online coffeehouse: www.CoffeehouseMystery.com where she posts bonus recipes, shares coffee picks, and maintains a message board. CLEO COYLE grew up in a small town near Pittsburgh, Pennsylvania. After earning scholarships to study creative and professional writing at Carnegie Mellon and American Universities, she began her career as a cub reporter for The New York Times. Now an author of popular fiction and bestselling media tie-in writer, Cleo lives and works in New York City, where she collaborates with her husband (also a bestselling author) to pen the Coffeehouse Mysteries for Penguin Random House. With well over 1 million copies of her books in print, Cleo Coyle has written 16 entries in the Coffeehouse Mysteries with the newest, DEAD COLD BREW, now a national bestseller in hardcover from Penguin Random House. This critically acclaimed series of light, amateur sleuth mysteries has earned two starred reviews. Multiple entries have been reviewer Top Picks, chosen for Best of Year lists, and featured as selections of the Mystery Guild. Together Cleo and her husband also write the bestselling Haunted Bookshop Mysteries under the name Alice Kimberly. When not haunting coffeehouses, hunting ghosts, or rescuing stray cats, Cleo and Marc are New York Times bestselling media tie-in writers who have penned properties for NBC, Lucasfilm, Disney, Fox, Imagine, and MGM. In their spare time they cook like crazy and drink a lot of java. You can learn more about Cleo, her husband, and the books they write by visiting www.CoffeehouseMystery.com. Scroll down the left column of the site's Home Page and you will see links to a number of online interviews that Cleo has given.